We play games for different reasons. Sometimes, we play a game to experience a story or the life of a character. Sometimes, we play a game for a fun experience with friends at a party. And then there are the times where what a game offers is a puzzle- an exercise for the player’s brain. 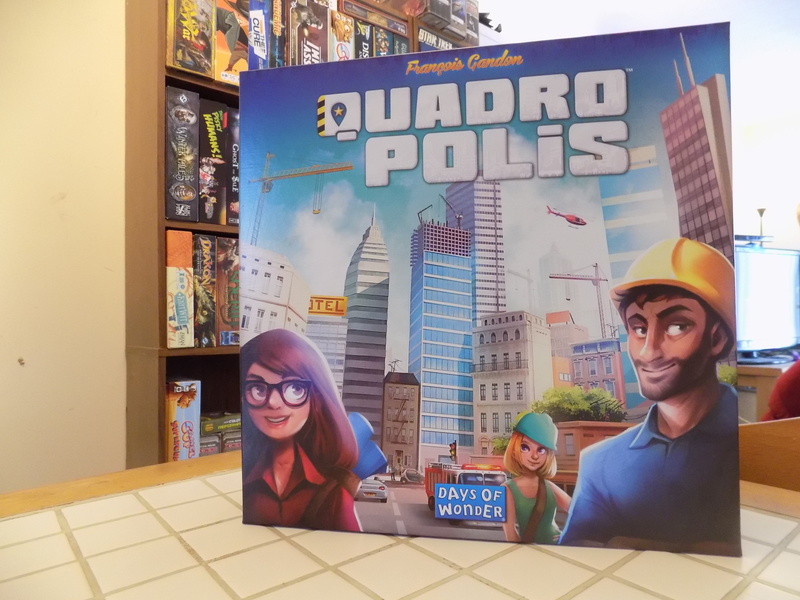 And one of the games where this couldn’t be the case more is Quadropolis, one of the newest releases from Days of Wonder and designed by Francois Gandon, a brand new designer who has hit the stage from seemingly out of nowhere. So, let me tell you about the puzzle that is Quadropolis. This game starts out simply enough, but soon things will become crowded, messy, and confusing- just like a real city! 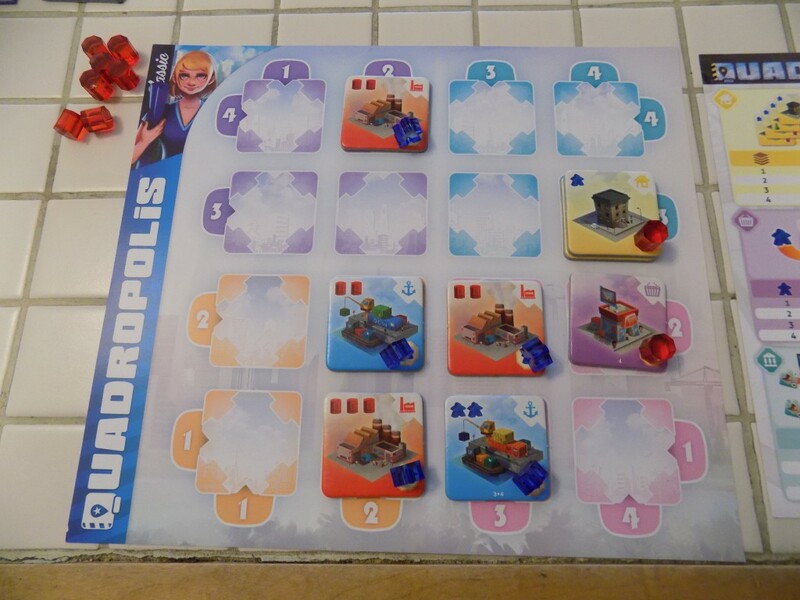 Quadropolis is a game for 2-4 players with games lasting anywhere from 30 to 60 minutes (or more.) But those are just some facts about Quadropolis, it isn’t what Quadropolis is. What this is is an interesting puzzle. 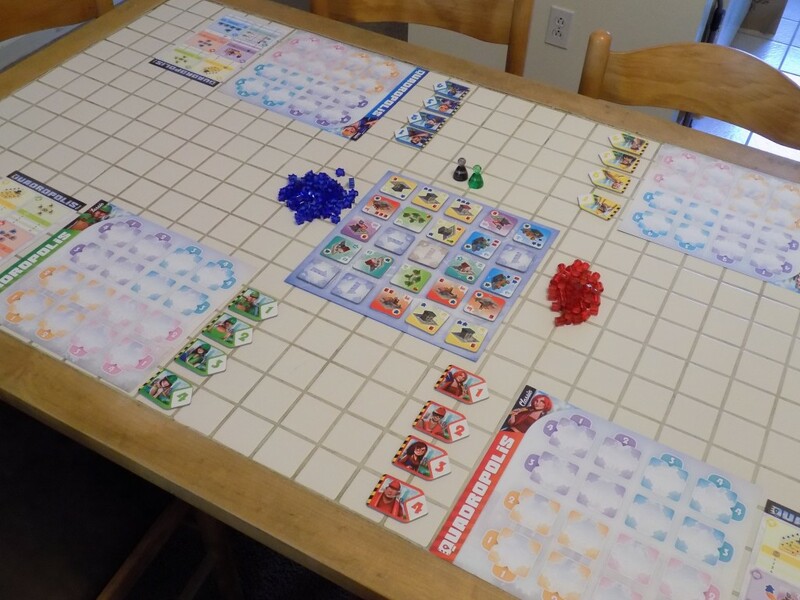 The game takes place over a number of rounds (either four or five, depending on whether you are playing the Classic or Expert version) in which each player takes turns selecting a tile from a central board and placing them on a mat in front of them. On the tiles are various types of buildings (parks, apartments, factories, municipal buildings, stores, or ports- with two additional types if you’re playing Expert mode) and many will give you resources (either people or energy or both). You use resources to activate a tile you have placed on your mat. At the end of each round, any unpicked tiles on the central board are cleared away and a new selection of tiles arrives. At the end of the game, any tiles that are activated score points depending on their position on the player’s mat and/or the relative positions of other tiles. But the puzzle of this game comes in on multiple layers, which I shall now describe. First, the tiles to choose from are laid out on the central board in a 5×5 grid. When a player selects a tile, they move a grey pawn (the Urbanist) to its empty spot. The next player may not select a tile from either the column or row which contains the Urbanist. 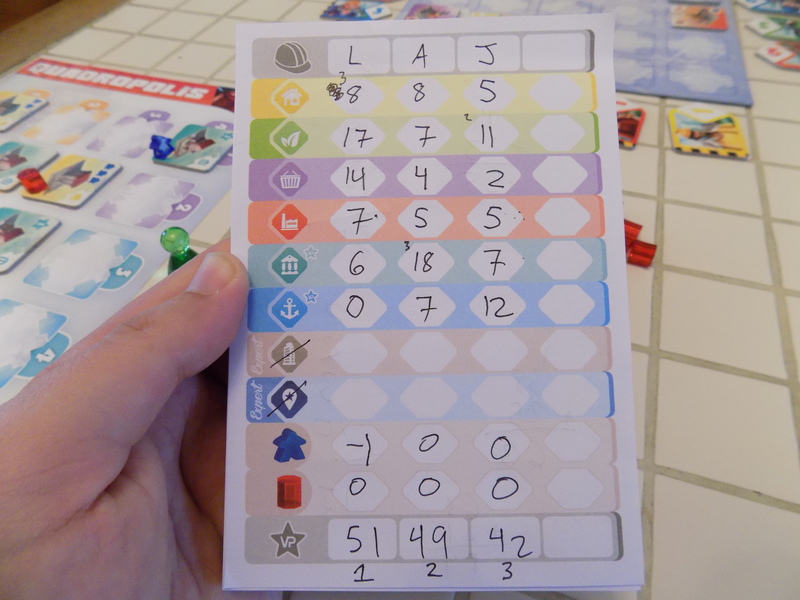 This mechanic (especially as a round continues on) can severely limit a player’s choices. The next level of puzzle is in how a player selects their tile (keeping in mind the hurdle provided by the Urbanist). Each player has four Architects (five if playing Expert). These strangely shaped tiles that resemble arrows each show a number in the range of 1-4 (with the additional one labeled five, again if playing Expert.) Now when a player selects a tile, they place the Architect against the edge of the central board with the point pointing down the row or column containing the tile they wish to take. The number on the Architect designates how deep into that row or column the tile is located. Are you with me, so far? If I place an Architect at a row on the left side of the board with the number 3, you count from the left along that row and take the third tile. Why is this a layer of the puzzle? Well, you cannot place an Architect where another player has placed one of their own, in addition to which, you only have one of each number (1, 2, 3, and 4- and also 5, if playing Expert.) The round is over once all players are out of Architects and this means again that as a round continues, your choice of tiles becomes incredibly constrained. But the puzzle isn’t over yet. Your mat on which you place your tile is a 4×4 grid (5×5 if playing in Expert) divided into four differently colored quadrants (or four quadrants with one central column if playing in Expert) and each column or row is assigned a number, 1-4 (and with a completely different system in Expert, which I will decline to describe here.) Where you place your tile is entirely dependent upon the number of the Architect you used to attain it. Did you use Architect #3? You must place your tile on a space in either the column or row labeled #3. The next level of the puzzle is the fact that the scoring of tiles (if they’re activated) is often dependent on the placement of other tiles on your mat (for instance, parks like to be next to apartments, factories like to be next to ports and stores, etc.) so you’ll want to pick up tiles using specific Architects to place them on specific places on your mat next to certain other tiles. What’s the last level of the puzzle, you ask? Well remember how I explained how tiles give you resources (energy and people) that you use to activate tiles so they can be scored? Every unit of resource that goes un-allocated at the end of the game will lose you points. So the final level of the puzzle is the fact that you’re trying to balance your choice of tiles. Did you just pick up a powerplant that gives you three energy? Well that sounds great, but now in addition to all the puzzling factors of how to choose a tile outlined above, now you need to think about choosing tiles that will consume that energy to activate so you don’t lose points. So the puzzle of Quadropolis is an amazing layered cake containing six different puzzles (the way I see it.) How you choose a tile (which is determined by the placement of the Urbanist, the number on your Architect, the placement of other player’s Architects, and of course the balancing of your resources) and where you place your tile on your own mat (which is determined by the number on your Architect and the how that tile is scored.) Now these six layers of puzzle may sound overwhelming, and I will agree that at first they may be, but they blend together so well that by the end of the first round, my mind was starting to work within the constraints of these lovely puzzle layers. I will admit, there is not a lot of player interaction, but similar to that other “lazy Sunday” style of game (and favorite of the site) Castles of Mad King Ludwig, this is a very low key game. Each player is busy working on their own little puzzle, figuring how to best place their own pieces. However, each player is stumbling around and getting in each other’s way in the placement of both the Urbanist and their Architect each turn. I guarantee that you will have your eye on a tile, only to be thwarted by that blasted Urbanist or another player’s Architect. So while your interactions with other players is accidental, it will happen on a fairly consistent basis- a player’s actions will drastically change where you will be able to select a tile from the central board (especially when it comes to the player directly before you.) So clearly, I have no issue with the lack of player interaction. What I do have an issue with (but is inevitable with a game with this magnitude of layered puzzles) is the final scoring. 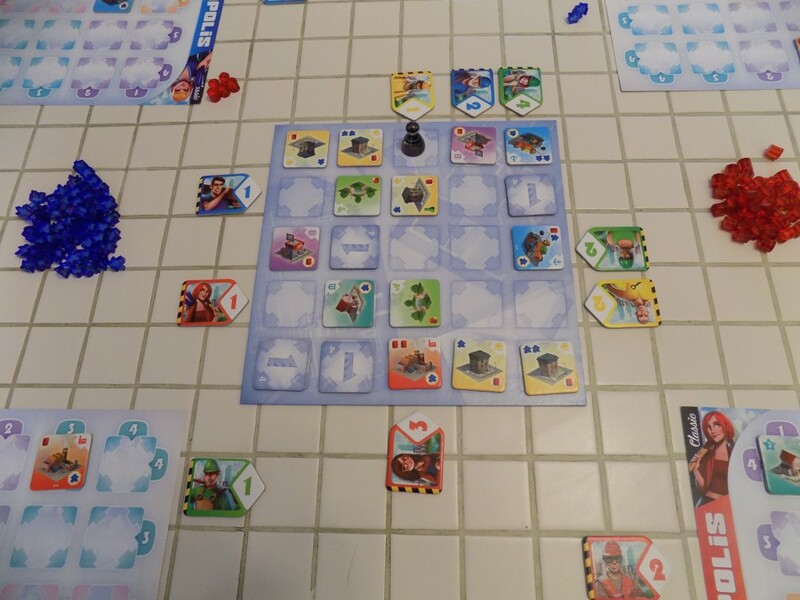 In a vein similar to Sheriff of Nottingham, after the game is over, everyone sits there as each player does some complicated math for each type of tile and reports it to the one player manning the score pad, who eventually totals everything up. I mean, honestly, look at that picture of the score pad. This thing is a beast and it will bring everything to a grinding halt as the scores are totaled. 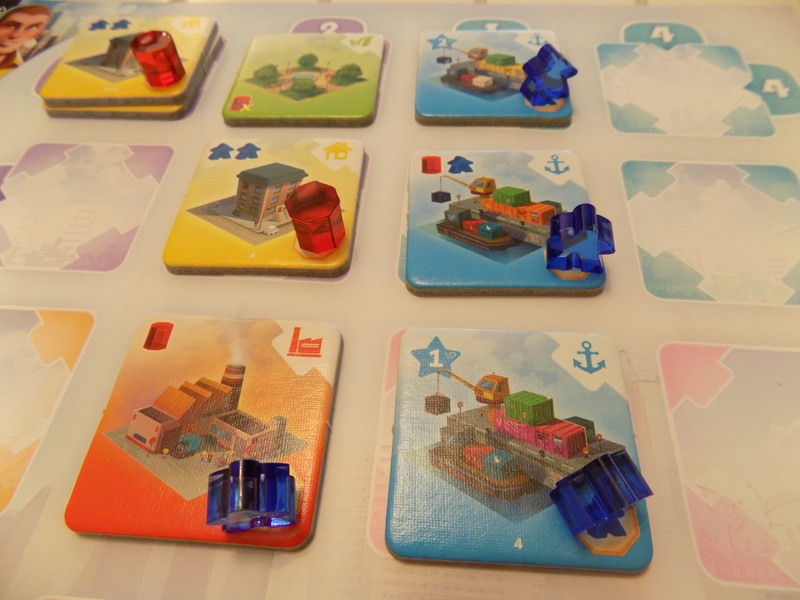 But I will withstand it to sink my teeth into the beautiful puzzle that is the gameplay of Quadropolis. Trying to squeeze the most amount of points out of where you place your tiles will make your brain fizz to the point that you’ll expect your earwax to melt and begin flowing freely- but I love that experience because although the puzzle is tough, it isn’t unfathomable. Furthermore are the options available to you as to what type of game you want to play. Included in the box are the aforementioned Classic and Expert versions of the game along with a mini expansion in which some of the parks are turned into playgrounds. This brings an element of replayability to this fabulous puzzle, and any regular readers of the site know that if there’s one thing I love, it’s replayability. So in summary, Quadropolis is a puzzle that I find fascinating- it may not be for everyone, but it most certainly is for me. I urge you all to at least try it and if you are of the puzzle persuasion, it is a must have. Get your hands on this one, dear reader.